The Belfast Campus Library entrance is on Level 2 and open 24/7. Facilities include informal and comfortable seating to allow users to meet and relax; display cases containing rolling exhibitions of student work as well as a selection of new Library stock and two computer rooms with PC and Mac workstations as well as individual desk spaces with power connections for mobile devices. There is a group study room with priority booking for student support sessions. 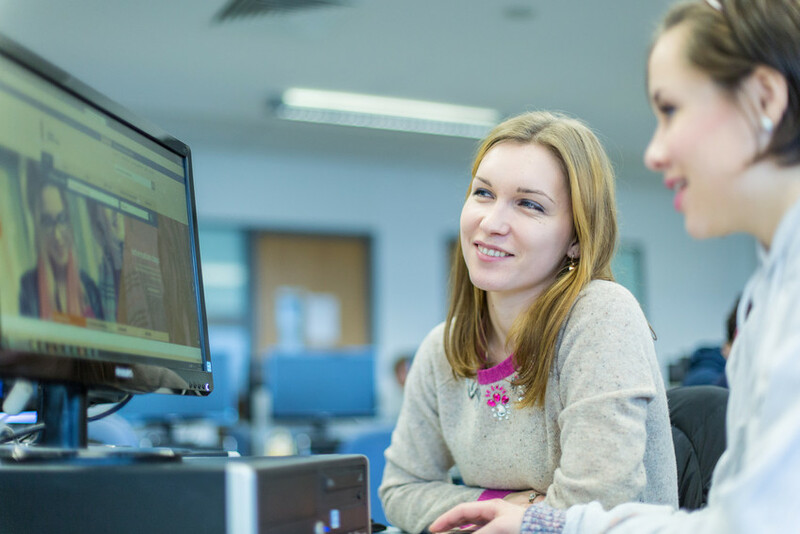 Level 1 contains reference collections and provides areas for quiet study. 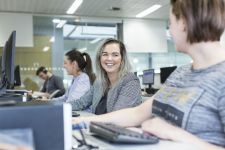 There is a variety of informal seating and some PC workstations as well as individual desk spaces with power connections for mobile devices. There are two group study rooms here, one with a large screen for use with laptops, the other with a large screen & PC. The ground floor (Level 0) contains the main book collections and a variety of informal seating. There are seats at large tables as well as at individual desks and high-level benching. There are two group study rooms here, one with a large screen for use with laptops, the other with a large screen & PC. In addition, there is an informal space for collaborative study with a range of seating, power connections and a large screen for use with laptops. The Coleraine Library occupies the top floor of the Main Building. The entrance area provides informal and comfortable seating to allow users to meet and relax. 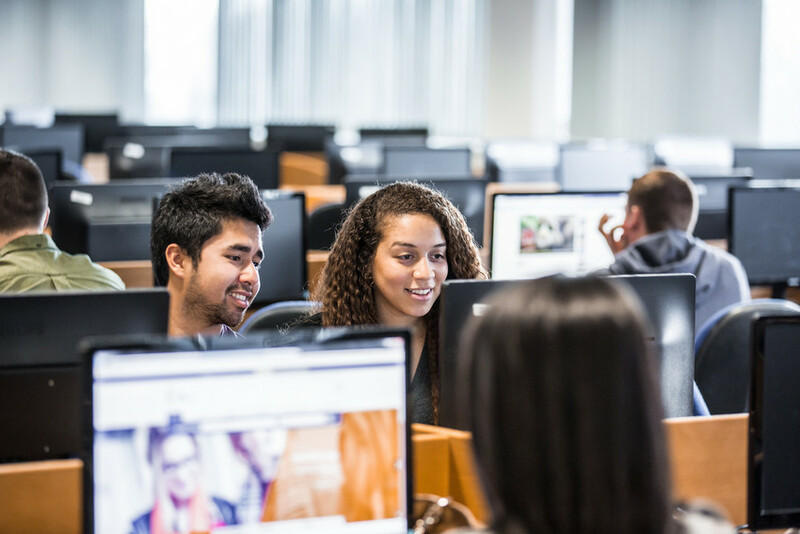 The IT Suite (e-classroom) contains 40 study spaces, each one with a networked PC. This space can be used when there are no classes scheduled and is designated a silent zone. The Open Access Area contains 137 study spaces, each one with a networked PC. This area is open 24/7. While Reading Room 1 and Reading Room 2 contain the book and journal collections, there are ample spaces for individual study. Reading Room 1 includes benching and is a designated silent zone. Between the two Reading rooms is a smaller room reserved for silent study. All study spaces have power connections for mobile devices. There are 5 group study rooms in the Library, two of which are for larger groups. They all contain large screens for use with laptops. There is a group study room reserved for student support sessions. 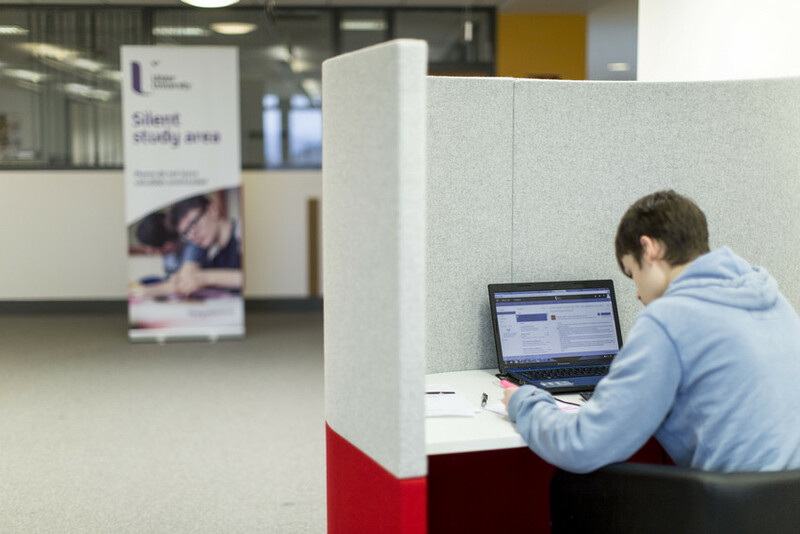 There are 600+ study spaces across the two floors of Jordanstown Library. These spaces provide flexible options for studying with areas for single and group study and zones for silent, quiet and social learning. These zones enable everyone to choose a space to work which suits them. The library has WIFI access throughout. 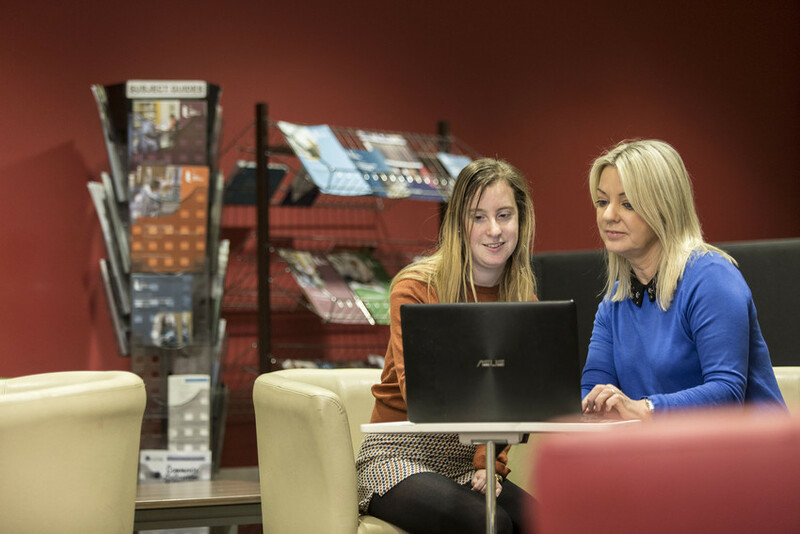 The Library Hub - Located on the ground floor this offers a more informal and flexible space. This includes moveable tables and chairs, sofas and a group study booth. Quiet Study Room - Located behind the Information Point on the first floor this room offers a mix of individual and small group study spaces with good access to power connections. Noise should be kept to a minimum. The Silent Study Room - This room is on the first floor and offers acces to 12 PCs and 14 individual desks, most with access to power connections. The Magee Library entrance area provides informal and comfortable seating to allow users to meet and relax. The Library has Wi-Fi throughout the building. The ground floor also contains individual desk spaces with power connections for laptops. The 1st floor contains individual desk spaces near the main book collections. There is also a common room area with drinks and snack vending machines to allow students to take a break and meet with friends. The 2nd floor contains two large areas with study spaces, the majority of which have networked PCs. One of these areas is a silent study zone. 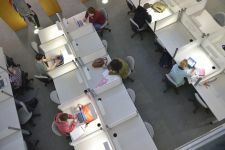 There is also a room for individual silent study as well as a large e-classroom with 50 networked PCs which can be used by students when the room is not in use for classes. There are 6 group study rooms on both the 1st and 2nd floors, one of which is reserved for student support sessions. All group study rooms are equipped with a large screen & PC.